CITROËN GRAND C4 SPACETOURER : MADE FOR LIFE'S JOURNEYS! 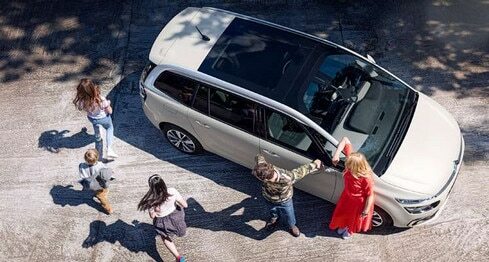 Designed with the best craftsmanship and creativity of Citroën, Citroën C4 SpaceTourer is a 7 seater minivan that is fully inline with its times. Intelligent driving aid technologies, driving sensations, overall comfort philosophy (Citroën Advanced Comfort® program) and efficiency: discover all its novelties in video! 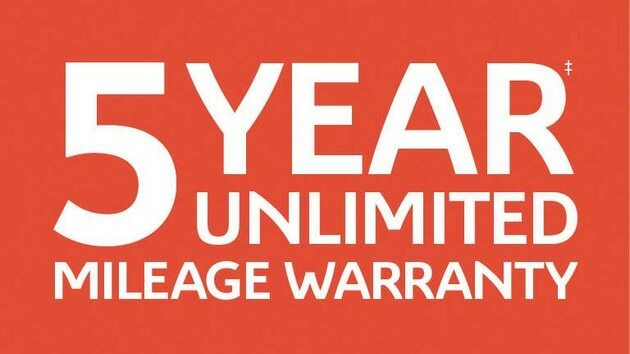 When you buy a new Citroën Grand C4 SpaceTourer you can relax with the knowledge that it comes with a comprehensive 5 year* – Unlimited Mileage Warranty covering any manufacturing defects that may arise, helping you enjoy care-free motoring in your new Citroën. 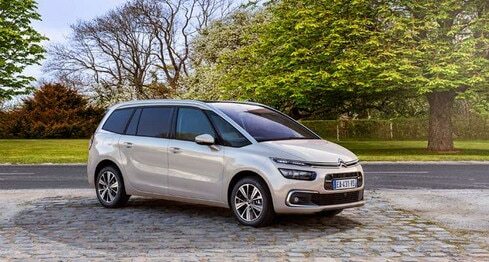 Citroën C4 SpaceTourer is first and foremost a vehicle of lively, modern styling. The unique, dynamic design gains in prestige with its bold looks and flowing lines. Styling is enhanced by the glossy black rear chevrons with chrome surrounds, a lively front-end design conveying a sense of performance and power, a black two-tone roof and silver roof arches. A wide range of body colours are available (Polar White, Platinium Grey, Steel Grey, Ruby Red, Lazuli Blue, Onyx Black, Soft Sand). 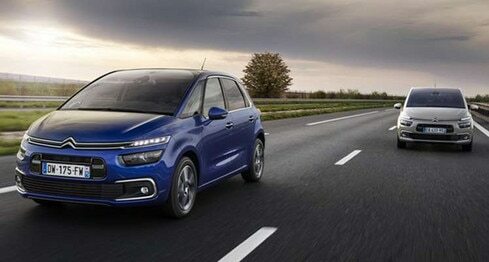 The front-end design of Citroën C4 SpaceTourer is lively and stylish. The three-stage light signature symbolises Citroën vehicles of today. The grille is split in two, separated by the body-coloured bumper, while the strongly tapered headlamps are drawn outwards by their mask. This two-tone roof underlines the character and performance of Citroën C4 SpaceTourer. Available as an option across the range of colours, this personalised feature enhances the MPV body lines. It comes with glossy black door mirror housings. Lighting that’s even more hypnotic! 3D effect rear lights are standard on Citroën C4 SpaceTourer. This modern, high-tech design plays on a perception of depth in which the light signature appears to be repeated endlessly. Citroën C4 SpaceTourer ships with new 17" 5-spoke black diamond-cut wheels. The diamond-cut effect is also black. At the rear, the glossy black chevrons with chrome surrounds reflect the positioning of the brand and underline the modern design of the MPV. 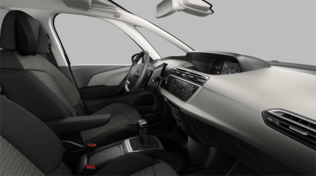 This functional ambience places the emphasis on easy use and on the quality of the materials used in the cabin of Citroën C4 SpaceTourer, with Milazzo Grey cloth upholstery matching the dashboard. Colourful and contemporary with the emphasis on space: the Wild Blue interior ambience immediately brings the world of sport to mind with its Levanzo Blue upholstery, and Délice Nacré dashboard featuring touches of chrome and blue laser-etching on the door crossbar trim. This ambience also includes massage seats, air vents on the dashboard and chrome-finish front door sills. The elegant Hype Grey ambience allies the refinement of Finn Black cloth/Grey leather upholstery with the Lounge Pack, giving you access to all the exclusive comfort features of your C4 SpaceTourer. With its Citroën C4 SpaceTourer MPV, the brand confirms its credentials and know-how in terms of comfort. The new model’s agility and extensive range of equipment offers an invitation to travel, with or without your family, along with a unique driving experience. Soft warm materials create a welcoming onboard ambience. On Citroën C4 SpaceTourer, the slush-moulded dashboard and specially treated door panels are soft to the touch. A wide choice of high-quality fabric and leather is also available. 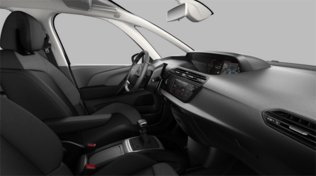 Citroën C4 SpaceTourer reaps all the benefits of the CITROËN ADVANCED COMFORT® programme. Bright, modular, connected, cocoon-like through the Lounge Pack, and with a unique sense of suspension comfort: these two versions of the MPV deliver a comfortable, relaxed ride, whatever the length of your journey. Need a large loading area? Citroën C4 SpaceTourer was designed to meet all your needs in terms of interior space and modular design. The seats in row 2 fold into the floor to create a perfectly flat floor space while the flat-folding passenger seat lets you load long objects of over 2.5m. If the family expands, simply reposition the seats stored under the floor. Another strong point of Citroën C4 SpaceTourer is its boot. The wraparound tailgate suggests robust strength and amplitude. The boot is easy to access and roomy, with capacity of 537 litres and up to 630 litres with the seats in row 2 pushed forwards. On Citroën C4 SpaceTourer the tailgate is motorised and also hands-free. This function lets you open the boot easily even when your arms are full, using the sensor under the rear bumper. Simply wave a foot to open or close the tailgate. Citroën C4 SpaceTourer provides passengers with three connectivity systems for easy navigation and a sense of continuity between the digital world and the car. With the Citroën Connect Nav, Connect Box and Mirror Screen technologies, you can navigate, hold a conversation or just relax! C4 SpaceTourer is also equipped with 15 driver assistance systems, providing extra reassurance and safety in day-to-day driving, to combat drowsiness or distraction at the wheel and prevent accidents. With the Mirror Screen feature on the Citroën Grand C4 SpaceTourer, use the USB socket and touchscreen to replicate or transfer the display of a compatible smartphone. View your multimedia content on the touchscreen and use your compatible smartphone apps directly and easily. Depending on the connected smartphone, apps can also be voice-controlled using the voice-recognition function. Mirror Screen works with Apple CarPlay™, Android Auto and MirrorLink®. Citroën Connect Nav is a connected 3D navigation system paired with a 7” capacitive touchscreen. 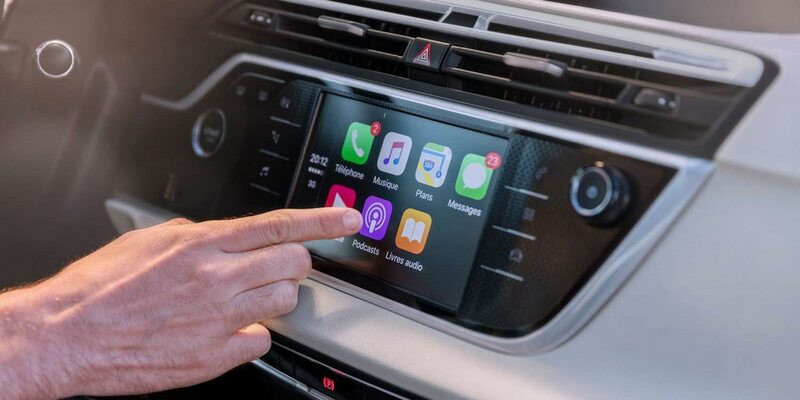 It also includes voice recognition to control Navigation, Telephone and Media features so drivers do not have to take their eyes off the road. The system comes with connected services such as TomTom Traffic for real-time traffic news, route planning, pricing details for service stations and car parks, weather forecasts, a local points-of-interest search function and a danger-zone option. Emergency geolocation call and assistance service. In the event of an accident or any other emergency, this function calls out the appropriate assistance service, either automatically or when the user presses the SOS button inside the car. Available 24/7, the service is free and without subscription. For even greater peace of mind, you can also contact the support switchboard by pressing and holding the “Double Chevron” button. For maximum comfort and driving pleasure, Citroën C4 SpaceTourer is now available with an EAT8 (Efficient Automatic Transmission 8) gearbox. 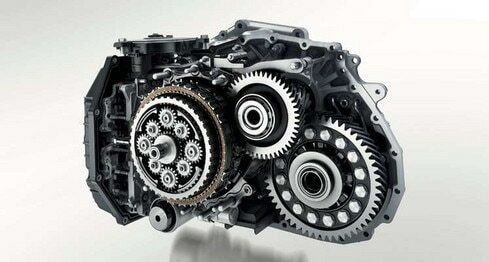 The EAT8 gearbox optimises gear change control while cutting fuel consumption and CO2 emissions. This new automatic gearbox cuts fuel consumption by up to 7% compared with EAT6. This result is achieved through the transition to 8 gears and through greater efficiency, with Stop & Start extended to 20 kph, EAT8 is also lighter and more compact. The smooth premium feel of the gear shifting function contributes to undeniable comfort in use. Featuring high-pressure direct injection and a new-generation turbocharger of advanced efficiency (240,000 rpm/min), the PureTech 130 S&S EAT6 3-cylinder turbocharged engine combines the performance of PureTech petrol engines with the efficiency of the EAT6 automatic gearbox for a more relaxed driving experience. The trade-off between low rev torque and power is the best on the market: 95% of torque available between 1,500 and 3,500 rpm, for easy use in all circumstances.